You Can Run a Marathon! 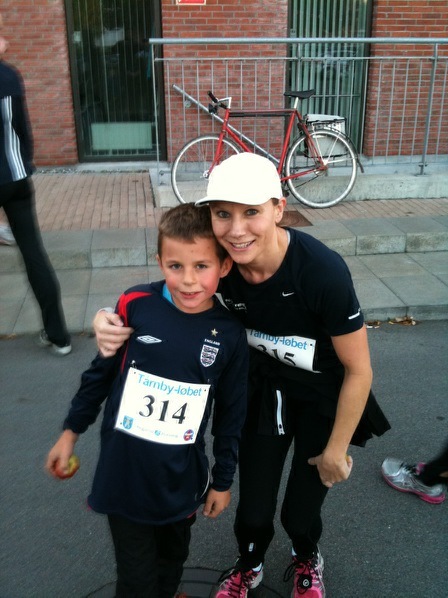 : Running With My Son! I had bought him so new Nike trainers and he wanted to run in them a little. He is actually very fast! I have signed us both up to two 5k runs. One in May and one in June. He says he is looking forward to racing and beating me! The thing is he probably will as when we ran a 5k together last October I was having trouble keeping up with him for the last 1k. He has also been running at his school every week. I won't let him win but I bet he wins over me anyway. I hear winter has eased up out there! Full on spring here of course. Keep up all the strength training stuff ..sprints, hills...of course don't over do it ;). Yes, the sun is out now but the cold wind is still blowing and normally does until May! Hi! I am a beginner too. Well, in really, I never run a Marathon. I run the Half Marathon in Las Palmas in January, but I fall down in km 18, and I could not finished it. I hope to run another one soon. Congratulations to share such a fantastic sport with your son. I hope you find another half marathon to run soon.